The U.S. Postal Service has posted an advertisement to solicit federal contract bids to lease minivans (like this one) to deliver mail. It's the first time the postal service will rent mail vans. The U.S. Postal Service now can't even afford the vans that deliver your mail. The cash crunch at the postal service is so severe that the agency for the first time is looking to rent mail delivery vans because it can't buy new ones. The postal service has posted an advertisement to solicit federal contract bids to lease minivans and cargo vans. It's no secret that the agency has been in financial turmoil. Last year, losses were so bad the agency twice defaulted on payments owed to the federal government. Much of the problem stems from a congressional mandate to make annual $5 billion payments for future retiree health care benefits. The decline in the volume of mail that most people send is also hurting. The postal service owns one of the largest fleets in the world, with more than 211,000 cars, trucks and vans. But the fleet is growing old and expensive to maintain. About 140,000 of the cars are Grumman Long Life Vehicles, the iconic, custom-made mail trucks, with steering wheels on the right. Those trucks currently range in age from about 18 to 25 years and are "approaching the end of their ... expected lives," according to a 2011 General Accountability Office report. The agency also has about 21,000 custom-made, flex-fuel mail trucks that are around a dozen years old. The GAO report found the postal service was "increasingly incurring costs for unscheduled maintenance because of breakdowns." The cost of replacing 185,000 of its older cars and trucks could near $6 billion, the postal service said in 2011. So leasing has emerged as a short-term fix. Spokeswoman Sue Brennan said leasing was an option only when "resources are not sufficient to meet vehicle requirement." Currently, the agency leases 377 vehicles, but most are cars used for administrative purposes. This would be the first time the agency leases any of the cargo and minivans that carriers use to deliver mail, according to the ad. Of course, not any old minivan will do the job. It must have a wire mesh that separates the cargo area from the driver to "keep parcels from flying forward and hitting the operator or any passenger," according to the ad. The spokeswoman insisted that the leasing move doesn't signal a long-term change in strategy. 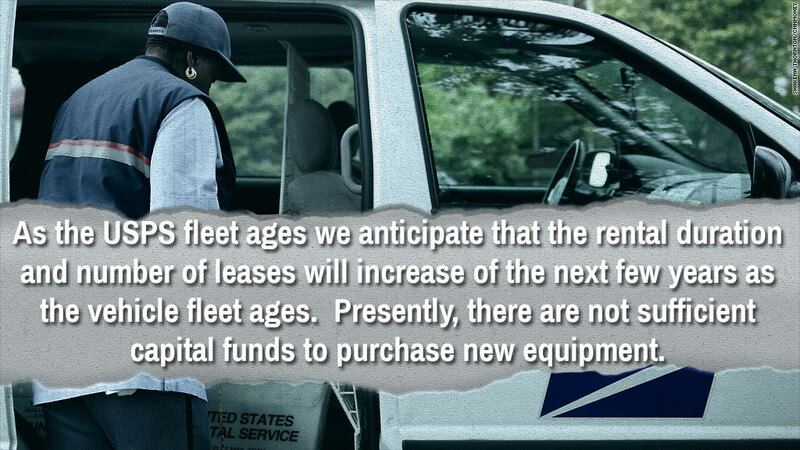 The ad, however, warns that "as the USPS fleet ages, we anticipate that the rental duration and number of leases will increase (in) the next few years."